Birds are an important part of just about any natural ecosystem. They eat bugs, spread seeds, and replenish your soils with fresh nutrients. But let's be honest, the real reason you want more birds in your garden is because it just makes this life so much more beautiful. Here are 3 features that will attract birds to your garden. So what are the 3 features you need to attract birds to your garden? Like all living things, birds need to feel safe if they’re going to spend time in your garden. They need places to rest and to raise their young. This means they’ll need lots of cover to shelter them from ground and aerial predators. Of course, they also need access to a variety of food and water sources. Within each of these 3 categories, there are different options you can pursue based on what will work best in your garden. To help you get started, this post covers 3 options for each category. But don’t worry about taking notes. We’ve created a free and easy-to-print cheat-sheet with all the information you need to attract birds to your garden. Back when we moved to our homestead this was just an open lawn. After planting this hedgerow of mostly native plants we now have birds visiting our yard on a daily basis. We love watching them from our front window. If you want birds to feel safe enough to stick around your garden, you’ll need to provide them some cover. A feeder way out in the open is just not a safe place for your feathered friends. Birds tend to fly from cover to cover working their way towards their goal. This lets them look for possible threats at each stop. While there are lots of ways to provide cover that will attract birds to your garden, here are 3 great options. Trees and shrubs provide great cover for birds and will help attract birds to your garden. Planting them in dense hedgerows or clusters will provide more cover than spacing them out. Make sure to add some evergreen plants for winter cover. Woody debris can come in many forms, such as snags (dead standing trees), logs, and stumps. So why add these? Woody debris is common in natural forests and provides many benefits. Critters that birds eat use them, but also birds will use them for perches and for nesting. Birds that nest and feed on the ground will feel much safer being able to hide around large logs and stumps. The spotted towhee, (a forest bird,) love the logs I placed on the ground near our feeder. Finally, make sure you provide some nesting areas. While trees, shrubs and woody debris can all do this, if you really want to attract birds to your garden, consider adding some bird boxes of various sizes. In our increasingly-urbanized landscapes, many birds have trouble finding suitable natural nesting areas like woodpecker holes. Providing nesting boxes are a great way to support these birds on your garden. Just be careful with the dimensions, especially with the entrance hole. Too small and the box won’t be usable. Too big, and it will let in predators or competing species. Putting up a bird feeder is a great way to support birds especially in the winter. My area got a freak snowstorm which made it hard for birds to find food. Once you have provided shelter for the birds in and around your garden, the next step is to make sure there is something for the birds to eat. There are 3 main ways to provide food to attract birds to your garden. Plant a mix of plants that produce seeds, fruits, berries, and nuts. Plant native plants to support local insects. A bird feeder is a great and easy option to provide food for birds. But not all birds can use the same feeder. Small feeders are great for small song birds, but bigger birds like grosbeaks will do better with larger feeders. Ground-feeding birds like the spotted towhee I mentioned earlier will prefer to get the goods that fall from the feeder. With all these different feeding habits, it’s important to plant a mix of plants that produce seeds, fruits, berries, and nuts if you really want to attract birds to your garden. You’re more likely to get a variety of avian visitors if the feeder is just one of many banquets for them to enjoy. Try to establish some plants that tend to hold onto their seeds, berries, or fruits well into winter. Roses, hawthorns, and sunflowers are all examples. These can help get birds through the cold winter. But the best thing you can do to attract birds to your garden is to plant native plants. Native plants support far more insects than non-native plants, and it turns out that the vast majority of birds feed their young exclusively on insects! If you want to learn more about why native plants are so important for birds, then check out the great book Bringing Nature Home by Douglas W. Tallamy. The Audubon Society has a great online tool to help you find native plants you can plant to attract birds to your garden. The tool shows which birds each native plant will attract. Birds thrive near water. And like all life, they need it to survive. You’re much more likely to attract birds to your garden—and keep them there—if you offer them a drink. Here are 3 great ways to provide water to your feathered friends. Protect and enhance any natural water features, like ponds. Add small artificial water features. The easiest way to attract birds to your garden with water is to simply add a bird bath. I put one near my bird feeder, but I made sure to set it up far enough over that seeds don’t fall into it. There’s also a snag next to it to serve as a perch, and I planted plants around it to provide some cover. The birds love it! Ponds and gentle pools in streams are great sources of water for birds. These can also be a food source for birds due to the insects that also make use of natural water features. If you have one near your garden already, then make sure to protect it and plant some shrubs or trees around it to provide cover. You also want to make sure the edges are not too steep and that there are some shallows for easy access. Try adding a log that goes from the shore into the water to help the birds access the water. You can also install an artificial pond near your garden. Just keep it as natural as possible and try to not use an artificial pond liner. Gleying is an old but effective technique to seal a pond. As with a natural water feature, make sure the edges of your artificial pond are not too steep and that there are some shallow areas. Having a natural or artificial water feature in your garden is a fantastic way to attract birds to your garden, but simply adding a bird bath will make a huge difference. This robin is sitting on a snag less than a day after I put it in my garden. By adding the features outlined in this post you can attract birds to your garden. You will be amazed how fast they show up! 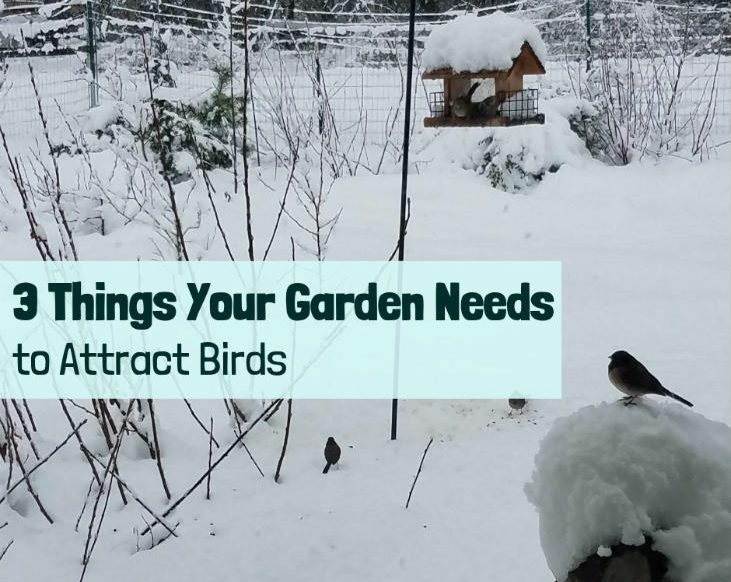 Are you ready to add these features and start attracting birds to your garden? Great! Take your time, and don’t try to do them all at once. Pick one option from each feature type as a starting point. For example, you could plant a fruit tree with some berries or other shrubs around it, and a few native plants mixed in. Then add a bird feeder and a bird bath nearby. Now you have a great habitat cluster that will attract birds to your garden. You can put this all on the north side of your garden, (or south side in the southern hemisphere,) so the new plants can help attract birds without shading out your other plants. Attracting birds to your garden will reduce the number of pests you have to deal with and bring you the joy of watching and listening to these winged wonders. To help you keep track of everything, we made a free and easy-to-print cheat-sheet with all the information covered in this post, so you can start attracting birds to your garden. Grab your cheat-sheet, and please leave a comment about why you want to attract birds to your garden.